Merle coat patterns, prevalent in breeds like Dachshunds, Great Danes, and Collies, can vary greatly. In this blog, researchers from Clemson University examined how these coat pattern varieties differ on the genetic level. Like other domesticated species, dogs show great diversity in the coloring and patterning of their coats. During domestication and breed formation, genes responsible for these phenotypes underwent strong selective pressure, including the pigmentation gene PMEL (aka SILV). PMEL is a protein found in specialized organelles responsible for producing the black and brown pigments that give hair its color. 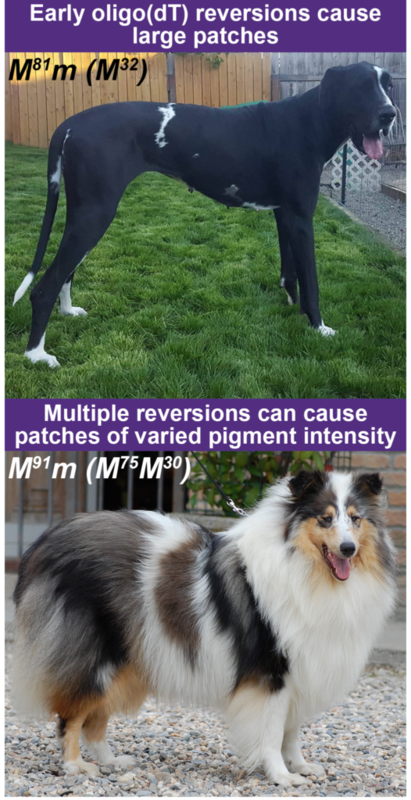 Heterozygosity for a Short INterspersed Element (SINE) insertion in canine PMEL causes a striking pigmentation pattern, known as merle, that is unique to domesticated dogs. A SINE is a type of retrotransposon, a “mobile” DNA element that can be copied and pasted into a new location in the genome. The most common canine SINE is about 200 base pairs (bp) long and has a stretch of adenine bases at its tail end. The insertion of the PMEL SINE is an event that occurred once in a common ancestor of the diverse breeds that have the phenotype, which include several herding breeds, Great Danes, and Dachshunds. A standard merle coat has two characteristics: a diluted base color and random patches of full pigmentation. In recent years, two spontaneous variations of merle have been recognized: dilute and harlequin. Dilute merles have a milder coat dilution with no patches. Harlequin merles have a white background with large patches of full pigmentation. In this study published today in Mobile DNA, we sequenced PMEL in dilute and harlequin merle dogs and found that variation exists only in the number of adenine bases in the tail of the SINE. We refer to this variable region as “oligo(dT)” because the SINE was inserted in reverse orientation relative to PMEL, resulting in a run of thymine bases at the beginning of the insertion. The Merle (M) SINE has an unusually long and pure oligo(dT). Dilution intensity likely correlates with the use of a cryptic splice acceptor site within the SINE that results in aberrant PMEL protein. Longer oligo(dT) lengths cause increased alternative splicing, more mutant PMEL, and less pigment. When we considered the two characteristics of merle patterning separately, we found that dilution or lightening of the base coat and patches of full color occur at unique oligo(dT) length thresholds. 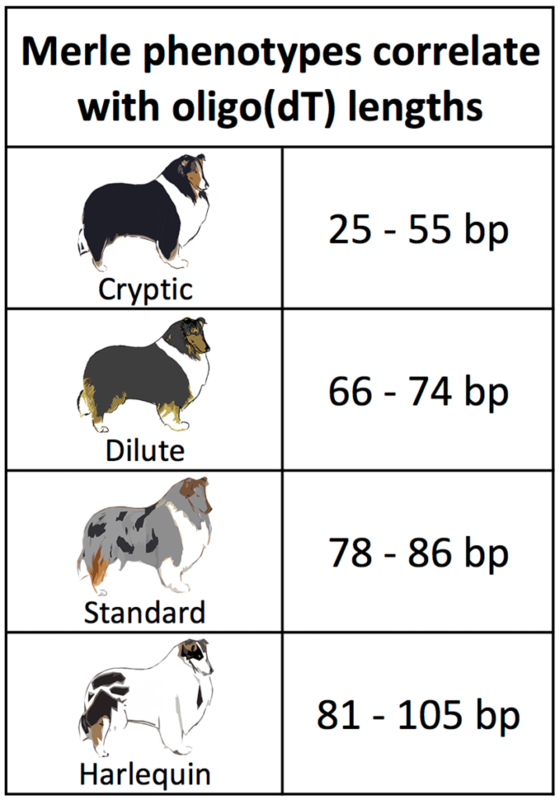 Coat dilution starts to occur somewhere between 56 and 66 bp and increases as the oligo(dT) length increases, such that dogs having lengths of 87 bp or longer have some or complete hypopigmentation (i.e., loss of color) of their base coat. Fully-pigmented patches begin to appear with oligo(dT) lengths between 75 and 78 bp. We hypothesize that during development, replication slippage on these long tracts causes frequent, random truncations to stable cryptic merle oligo(dT) lengths. Somatic cell populations in which the oligo(dT) length has reverted to cryptic merle lengths produce normal PMEL protein, resulting in patches of full pigmentation. Longer oligo(dT) lengths are less stable and experience more frequent, earlier reversions during development. Some dogs have patches of full pigmentation that are so large they appear at first glance to be non-merle dogs. Others have multiple somatic reversions to various oligo(dT) lengths, yielding large patches with an array of dilution intensities, a pattern sometimes referred to as tweed. 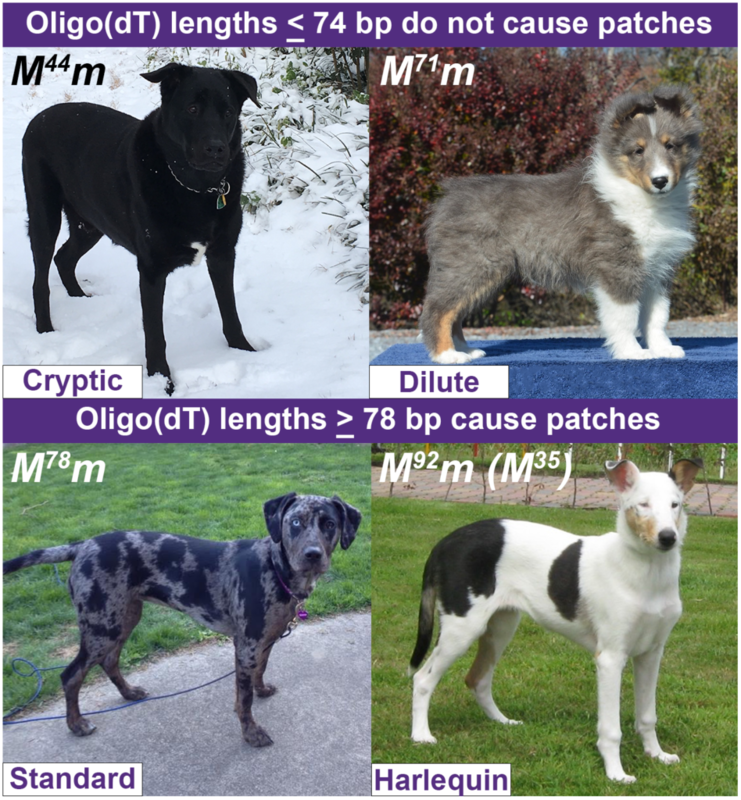 Oligo(dT) lengths representing somatic reversions are denoted in parentheses (e.g., a dog that inherited an oligo(dT) of 86 bp but has a detectable somatic reversion to 45 bp is reported as M86m (M45)). Spontaneous changes in oligo(dT) length can also occur in the germline, such that a standard merle dog can produce a “surprise” dilute or harlequin merle puppy. 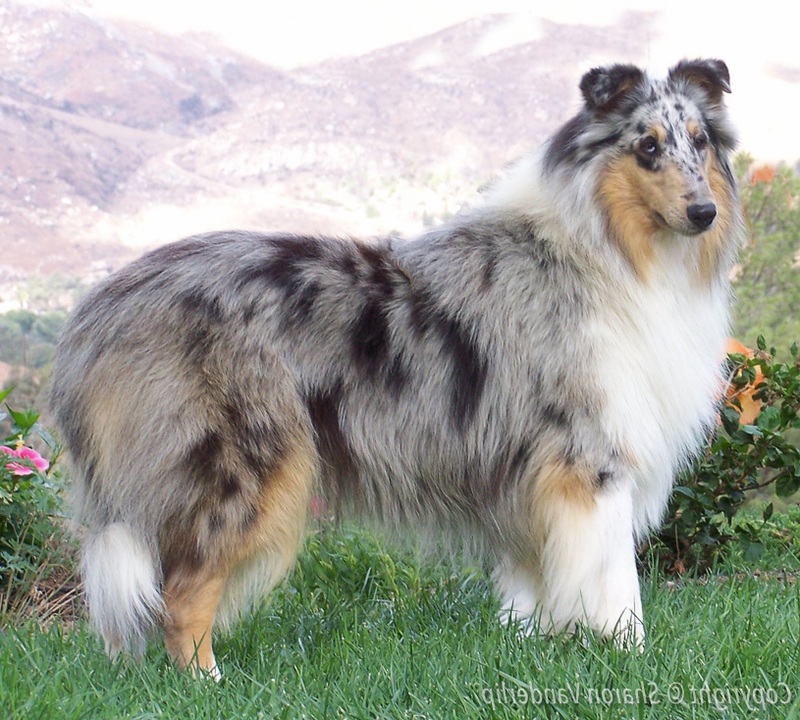 The dilute merle phenotype resembles the characteristic grey coat of a recessive disease of collies, cyclic neutropenia, that requires humane euthanasia of puppies. Harlequin merle can resemble another common coat pattern, piebald, which can be troublesome for breeders in countries or breed clubs where this phenotype is prohibited. Although merle is one of the more popular coat patterns of dogs, it is not without controversy. Merle-to-merle matings can result in double merle (MM) offspring that have ocular (including blindness and microphthalmia) and auditory defects; this is possible even for merle-to-cryptic merle matings. We hope this work will raise awareness among breeders that there are merle varieties that do not fit the standard phenotypic description and that this knowledge will prevent undesirable matings and mischaracterizations. Sarah Murphy, B.S. is a graduate research assistant in the Department of Genetics & Biochemistry at Clemson University. Her dissertation research focuses on the genetic basis of congenital idiopathic megaesophagus in German Shepherd Dogs and Great Danes. Dr. Leigh Anne Clark began studying canine genetics in 2000 as a doctoral student at Texas A&M University. In 2009, she moved to the Department of Genetics & Biochemistry at Clemson University where her laboratory studies the genetic underpinnings of hereditary diseases and phenotypes of dogs. Dr. Clark identified the Merle SINE in 2005 and is currently owned by a standard merle collie.